Click here to read my full review of the Co-Motion Pangea. 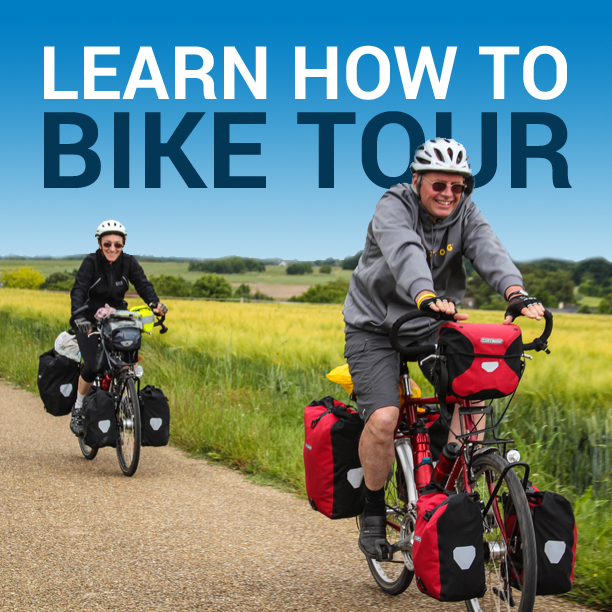 I’ve been bicycle touring all around the world for more than a decade now, so when I began planning a 14-month-long bicycle tour across 24 different countries in Europe and Africa, I decided to seek out my ideal touring bicycle. I wanted a bicycle that could go anywhere and do anything; that could be ridden on paved streets, dirt roads, and rocky off-road terrain; that looked good and could be customized to my specific needs; that could carry all the belongings required to survive on the road for weeks or months at a time; that was comfortable, dependable, easy to repair, and possessed incredible stopping power. I wanted to find the world’s best on-road / off-road touring bicycle… and that’s when I found the Co-Motion Pangea. For the last two years now, I’ve been using the American made Co-Motion Pangea touring bicycle to navigate through more than 24 different countries in North America, Europe and Africa. I have cycled thousands of miles through sand, snow, mud and ice; climbed hundreds of steep mountains, sped pleasantly through the flat-lands, and flew downhill with joy. Using Co-Motion’s optional S&S couplers, I was able to split the Pangea in half and easily transport the bicycle on dozens of boats, buses, planes and trains, packing the bicycle inside an airline friendly case that saved me hundreds of dollars on shipping and baggage costs. With 26 inch wheels and tires, disc brakes, an expertly designed frame, and mounts for fenders, front and rear racks and three water bottle cages, the Co-Motion Pangea is truly an incredible bicycle touring machine capable of handling both smooth tarmac and the roughest off-road terrain. To learn more about the Co-Motion Pangea touring bicycle, just click here. This entry was posted in Bicycle Touring Pro Articles, Bicycles, Featured Articles, Product & Service Reviews, Products, Videos and tagged bicycle touring pro bike, co-motion, co-motion cycles, co-motion pangea, co-motion pangea video, comotion, pangea bicycle, pangea touring bicycle, pangea touring bike, touring pro bicycle. Very nice looking touring bike. Rugged and comfortable looking for long haul tours. With the 26 inch wheels and the wide tires it resembles a non-suspension frame (ridged frame) Mt. bike. Something I didn’t expect to see on a modern touring bike. However, the geometry is confusing. From the pictures it appears to have a relatively short wheel base like that of a road bike or an old sports touring bike. The split frame is an awesome feature. My first touring bike and the best one that I ever had was a 1985 Schwinn High Sierra Mt. bike. What is your opinion on these early vintage, ridged frame Mt. 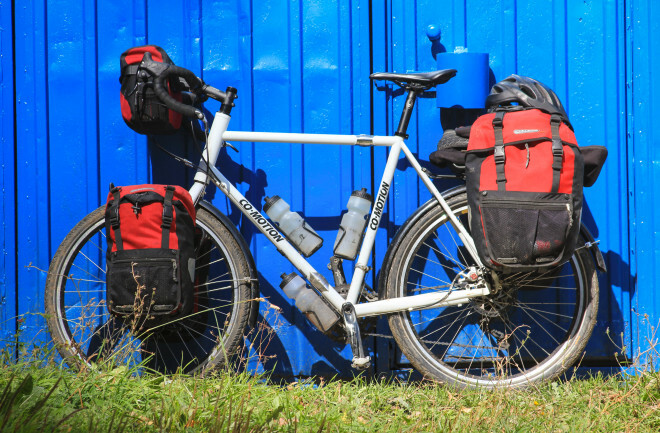 bikes used for touring compared to a modern touring bike such as ones or ones comparable to a Surly long Haul trucker, or a trek 520. Also, what is your opinion of the wide 26 inch tires (1.9 I think) that came on the co-motion. Do you find any dramatic differences of them compared to a 700cc or a 29er. What is the smallest width tire do you mostly use for both on and off pavement. Doug, I used a mountain bike like the one you are talking about on my first two bike tours. I loved riding that bike around town, but would never use it again on a long distance bike tour. http://bicycletouringpro.com/sierra-schwinn-my-first-bike/ There are several reasons for this, but I won’t go into them here. As for the wide tires on the Co-Motion Pangea, I really liked the tires and felt no resistance from them because they are so wide (as you might expect). However, the tires did wear out very quickly and I’m not sure why. Now that I have ridden with both 700c and 29 inch tires over the last 14 years, I can’t say I prefer one over the other. As is the case with so many things with bicycle touring, it just depends on what you are hoping to do with the bike and where you are hoping to go that determines which type of bike, wheels, tires, etc you need to use. You looking so cool and more comfortable riding a long haul tour. Do you have plan to tour in Nepal? I have not been to Nepal, nor do I have any immediate plans to go there. But maybe I’ll be there at some point in the near future? Nice bike. I have a custom built Waterford touring bike. It has all the features of the Co-Motion except I didn’t get the couplers. It is a lugged steel frame bike that can use 38mm wide tires or wider. Of course it has fenders and bottle mounts. Lugged steel frame bikes provide great handling and a very comfortable ride for the long tours. The only regret I have is that I waited too long to make the investment and throw away my carbon fiber “racing stick”. Beautifully shot and narrated video! A tribute to this wonderful bike and your cinematic skills! Happy Holidays, and thanks for sharing your learnings with us bike and (wannabee) bike tourists. What do you do with the travel bag once you start your tour? I plan on flying into one country and out another and don’t see a good way to pack the bike without carrying the case with me.